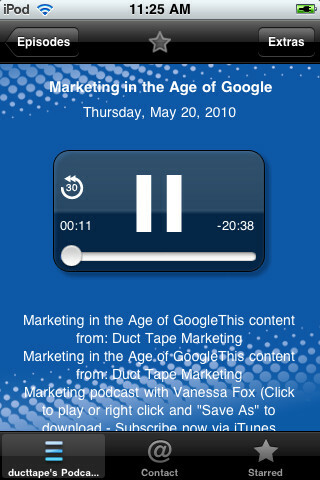 For now the main purpose of the app is to provide a more functional way to deliver my audio interviews. The application gives you a good way to search, sort and bookmark over a hundred interviews and features content I’ve never released publicly. I’ll add another interview each week and also feature exclusive “app only” audio content each week. Upcoming segments include Zappo’s CEO Tony Hsieh, Power Friending author Amber MacCarthy, Open Leadership author Charlene Li, and Constant Contact CEO Gail Goodman. I’ve chosen the portable audio format so you can take me in your car, on your run, or on the train. Hope you enjoy and let me know what you would like to hear.